The Coraline Completely Frameless Sliding Tub Door model - A tub-height sliding glass door for an existing 60 inch tub alcove. With premium frosted 3/8 inch tempered safety glass; tested and certified to ANSI Z97.1 Standard and an innovative two-wheeled roller system. The Coraline is available with stainless steel, chrome or oil rubbed bronze hardware options. Coraline's variety of finishes and glass will create an upscale custom solution for your existing tub alcove. Images are for representation only. Once installed, glass may differ slightly than shown in image due to the nature of light absorption and reflection from your own bathroom's colour, design or decor palette. This is normal and should be expected in certain scenarios due to the glass's natural composition. 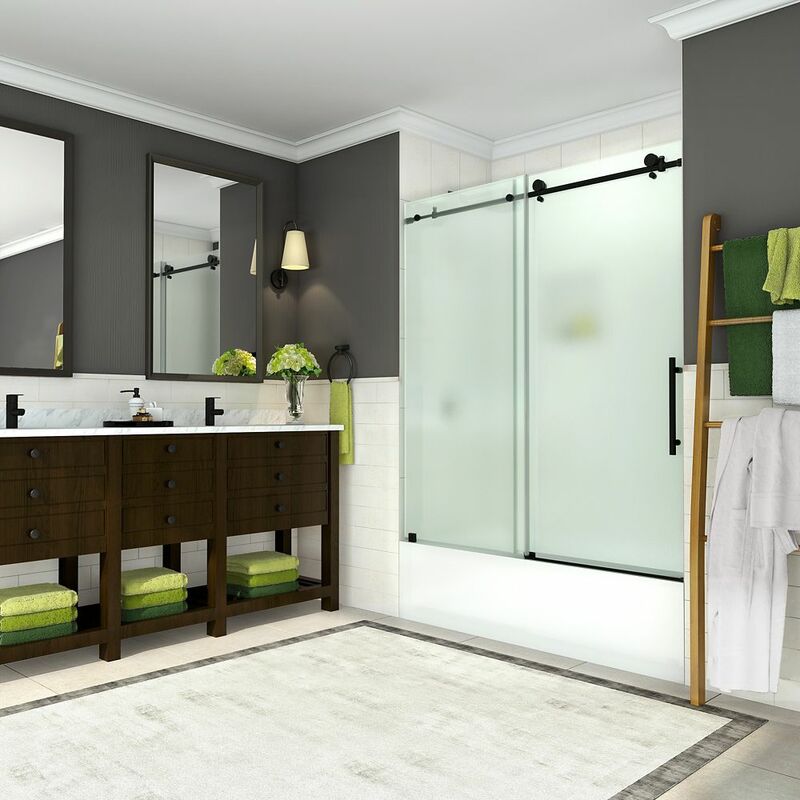 Coraline 56 to 60 inch x 60 inch Frameless Sliding Tub Door with Frosted Glass in Oil Rubbed Bronze The Coraline Completely Frameless Sliding Tub Door model - A tub-height sliding glass door for an existing 60 inch tub alcove. With premium frosted 3/8 inch tempered safety glass; tested and certified to ANSI Z97.1 Standard and an innovative two-wheeled roller system. The Coraline is available with stainless steel, chrome or oil rubbed bronze hardware options. Coraline's variety of finishes and glass will create an upscale custom solution for your existing tub alcove. Images are for representation only. Once installed, glass may differ slightly than shown in image due to the nature of light absorption and reflection from your own bathroom's colour, design or decor palette. This is normal and should be expected in certain scenarios due to the glass's natural composition.